Swing Singer Jamie Mac presents The Mac Pack a tribute to the legends of swing including Sinatra, Dean Martin, Bobby Darin & Michael Buble. Jamie has a natural talent to entertain with a fantastic voice together with an ability to captivate his audiences he always leaves the crowds wanting more. Jamie is known as ‘Mr Versatile’, with a vocal range that covers many different styles and genres. Originally from the West Country, Jamie relocated to Scotland in 2004. He has been singing, dancing and acting for fifteen years and his talent has taken him to venues all over the world. Jamie started his career in 1996 as Resident Entertainer in a holiday park in his hometown of Burnham on Sea and it was clear from the start that this was the career path for him. Over the next six years he performed in holiday parks and in entertainment centres around the country. He was soon promoted to Assistant Entertainments Manager and ultimately Senior Entertainments Manager. The winter months saw Jamie performing on P & O Cruise Ships and working in venues all over Europe. Jamie has played Prince Eric in ‘Sleeping Beauty’ for M & M Theatrical Productions. Touring throughout the UK. In 2007 Jamie left his much-loved role within M &M to pursue his solo career as a singer and entertainer. This was his first time on the cabaret circuit in Scotland and he spent this first year performing in pubs and clubs building a reputation as an act was worth rebooking! 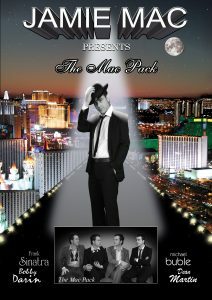 In 2008 Jamie produced and showcased ‘The Mac Pack’, a tribute to the big band era. This show generated many return bookings and has lead to Jamie performing in Scotland’s finest venues. In 2008 Jamie launched a double tribute show ‘Swing into Soultown’ where he performs all the greatest big band hits and Soul & Motown dance floor classics. Since then Jamie has produced another two hit shows ‘Mr Versatile’ & ‘Buble’ Nights’ which have generated bookings from entertainment venues across the UK. 2015 sees a brand new challenge for Jamie; his latest venture ‘The Jersey Notes’ has already hit the stage to sell out crowds. Given his track record it’s sure to be a huge success. Watch this space!! Jamie continues to be one of the most likable and popular acts in the business.